TOPAZ HORIZON: My favorite new cool thing: my eyeglasses' Transitions lenses! My favorite new cool thing: my eyeglasses' Transitions lenses! Posted this over at my Instagram because I am sooo in love with my new Transitions® Signature™ Lenses! Because I'm nearsighted, I've been wearing glasses for 25 years. It's safe to say that I have a huge interest in all things glasses. For many people, glasses are just an accessory. For me, my life depends on them! So anytime I see an ad on eyewear or an article on lens technology or optical shop sales, I am there! Last year, I was so excited when Transitions® Signature™ Lenses approached me and said they're here in the Philippines! I have longed for lenses that react to sunlight for the longest time! Transitions® Signature™ lenses are the most responsive adaptive lenses, developed from Transitions Optical’s latest patented Chromea7™ technology and tested with an exclusive measurement methodology, Life360™. Lots of big names and patents and trademarks there, no?! This is because these lenses are the BEST!!! And now I own a pair!!! 1. This technology can be used on any prescription. Whether mataas ang grado ng mata mo or mababa, pwede siyang gamitin! 2. Transitions® Signature™ Lenses are not sunglasses. They are activated by UV light. So they don't darken when indoors and at night. They're clear. Like any normal sunglasses! 3. Because they react to the strength of the sun's rays, you get different levels of darkness. So if it's cloudy, it darkens a little lang. If the glare is super bright, didilim talaga siya. So kahit pabago-bago pa ang weather (sunny one minute, then cloudy the next) at kahit saan ka pa magpunta (lunch out tapos biglang papasok sa dark building), you won't need to remove your glasses. 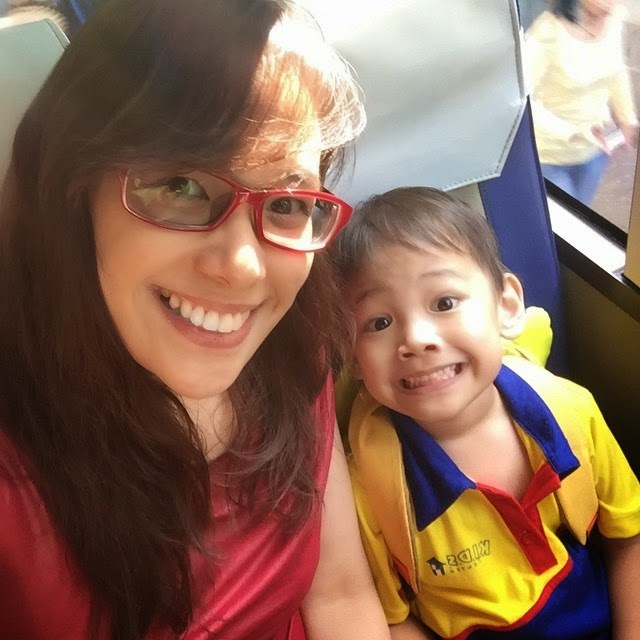 As a mom who also works as a freelance writer and editor, I'm always on the go. I'm running errands, paying bills, playing with my kids at the playground, fetching my preschooler from school, attending meetings and events everywhere, flagging down taxis, sourcing items from shops, going to photo shoots. It's fun! But I'm aware that my schedule means I'm exposed to the sun a lot. I'm very allergic to sun exposure! The sun's UV rays do so much damage to our skin. So I make sure I slather on sunscreen with high SPF and I wear sunglasses with UV protection. Yes, kahit na nasa loob ako ng bahay, naka-sunscreen ako. We have huge glass windows, you see, so our home is super maliwanag. I need to be protected from those nasty UV rays inside my house. I love that now, even when I'm at home, my eyes are still protected! Kaloka naman kasi kung nasa bahay lang ako tapos naka-shades, right? Anyway, mahaba na ito. I'll talk more about my Transitions® Signature™ Lenses in another post. I'll do a video pa so you can see my lenses darken! Hi! I also love transition lens :) Been using it since 2012! I had to choose a frame which is similar to sunglasses so when it gets dark parang shades lang hehe. You have to ask your optometrist about it since cost depends on your grade, size and type of lens, and other coatings (UV, non-reflecting, etc). There's no fixed rate. As for availability, any leading optical shop should offer it. So again, ask your optometrist. Hi Frances, just wanted to ask if it darkens too much at night, for example when you're driving and there's a super bright light from a vehicle on high beam? My eyes are so sensitive to light and I was thinking of saving up for a pair.